The state’s first-ever, comprehensive pedestrian safety plan offers pedestrian safety improvements across upstate New York and Long Island during the next five years. New pedestrian safety web site launched. Photo by: New York State Department of Transportation, via Facebook. Albany, NY - June 20, 2016 - Governor Andrew M. Cuomo today announced the state’s first-ever, comprehensive pedestrian safety plan, a proactive, multi-agency initiative that provides $110 million for pedestrian safety improvements across upstate New York and Long Island during the next five years. The program will utilize an engineering, education and enforcement campaign to enhance safety. To kick off the campaign, the Governor introduced a new pedestrian safety web site. 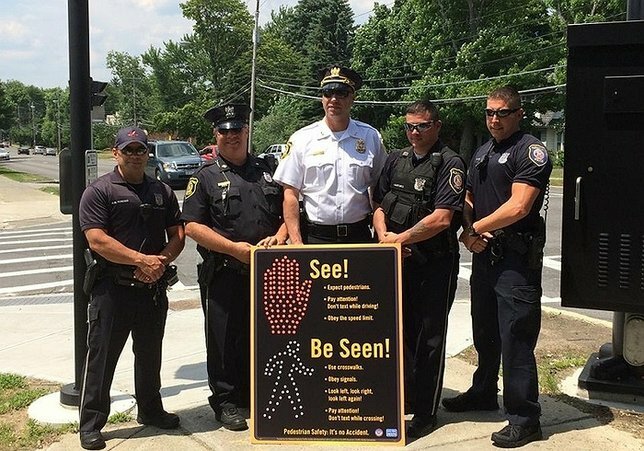 Beginning today, more than a dozen police agencies across the state are conducting pedestrian safety enforcement campaigns that will run through July 3. "Supporting these education programs and enforcement efforts will set a new safety standard for pedestrians and motorists and help make this state’s roadways safer for all,” Governor Cuomo said. "Through these efforts, we will help prevent avoidable tragedies and save lives." The New York State Pedestrian Safety Action Plan, which the Federal Highway Administration supports, takes a three-pronged approach to improving safety during a campaign that will run through State Fiscal Year 2020. It is being implemented cooperatively by the New York State Department of Transportation focusing on engineering improvements, the State Department of Health conducting public education and awareness campaigns, and the Governor’s Traffic Safety Committee coordinating increased law enforcement. The plan targets improvements in communities outside of New York City. The city has an established pedestrian safety program that receives millions in federal funding administered by NYSDOT. The pedestrian safety plan supplements other traffic safety programs, including this year’s Highway Safety Improvement Program grant awards for projects that will enhance safety and mobility on roadways across the state. A list of HSIP project awards by region is available here. Sixty one percent of the contributing factors to pedestrian crashes were related to driver actions, while 37 percent were related to pedestrian actions. For drivers, the top two contributing factors were driver inattention and failure to yield right of way. For pedestrians, the top two were pedestrian error and pedestrian failure to yield right of way. The Safety Action Plan, part of the state’s broad effort to improve traffic safety, supports the State’s Complete Streets Law and is consistent with the Americans with Disabilities Act Transition Plan. Governor Cuomo signed the Complete Streets Law in 2011, requiring state, county and local agencies to consider the safety and convenience of all users when developing transportation projects that receive state and federal funding and are subject to NYSDOT oversight. Funding for the plan’s implementation will come from the federal Highway Safety Improvement Program, as well as other state and federal funding sources. The plan calls for a systemic approach to proactively address widespread safety issues and minimize the potential for crashes by implementing low-cost countermeasures throughout the roadway network. Pedestrian safety site evaluations will begin this year on state-owned roadways, including at 2,000 crosswalks without traffic signals and 2,400 signalized intersections. The second year of the plan, NYSDOT will fund local pedestrian safety initiatives identified through a project solicitation. Information about that funding will be available later in the year. Improvements at crosswalks without traffic signals will include pavement markings and signs. Up to 400 locations will receive enhanced treatments as warranted, including refuge islands and attention-grabbing light beacons. At signalized intersections, high visibility crosswalk markings and additional signs will be installed. Signalization will be enhanced with extended crossing times, countdown timers that tell pedestrians how many seconds they have to cross the street and leading pedestrian intervals that help make pedestrian more visible to motorists by giving them a head start before traffic can turn onto the street. These sites also will be evaluated for enhanced treatments, such as pedestrian refuge islands or median and curb extensions. In addition, NYSDOT will evaluate for potential safety improvements five corridors with a higher-than-expected number of pedestrian crashes. At the same time, the State Department of Health will produce and place public service announcements about pedestrian safety, engage local traffic safety boards, schools and others in public outreach, and provide training for safety organizations. The Governor’s Traffic Safety Committee will encourage police agencies to apply for traffic safety grants in the 20 communities with the highest number of pedestrian crashes, provide education for law enforcement and justice officials, and organize an annual pedestrian safety law enforcement blitz. The plan calls for the communities with the highest number of crashes from 2009 to 2013 outside of New York City to be given extra attention to improve pedestrian safety. That will be done by providing education, enforcement and funding for safety improvement projects through a competitive grant solicitation. A list of the communities is attached. A targeted enforcement campaign by police agencies along the corridor starts today and runs through the end of next week with the goal of improving both driver and pedestrian safety. Police will hand out a warning notice, developed by GTSC and DOH, which details State law regarding pedestrians. They also may issue tickets to both pedestrians and motorists for violating the law. In addition, police will have supplies of informative motorist and pedestrian safety tip cards to distribute. Furthering the education effort, a pocket guide covering vehicle and traffic law related to pedestrians was developed for police personnel. It serves as a resource that law enforcement personnel can keep in their patrol car glove boxes for quick reference. In addition, a fact sheet will be distributed as part of outreach to local courts to inform them of the campaign and help reinforce the importance of the issues that are being addressed with this focus on pedestrian safety. Congressman Eliot Engel said, “Those of us who live in or around the busy streets of New York City know we can never be too safe when it comes to protecting pedestrians. I support Governor Cuomo’s New York State Pedestrian Action Plan, which is supported by the Federal Highway Administration and will undoubtedly improve public health and safety. The educational campaign stresses that drivers and pedestrians must avoid distractions and not text or use mobile devices while driving or while walking across a street. For more information, visit Governor Cuomo’s new pedestrian safety website. It provides an overview of the pedestrian safety plan, examples of highway safety improvements that can enhance pedestrian safety and tips for safely navigating roadways as a pedestrian. Follow New York State DOT on Twitter and Facebook. Kid-Friendly Halloween Events Happening Across LI this October! Subject: LongIsland.com - Your Name sent you Article details of "Governor Cuomo Launches $110 Million Initiative to Keep Pedestrians Safe Across New York State"